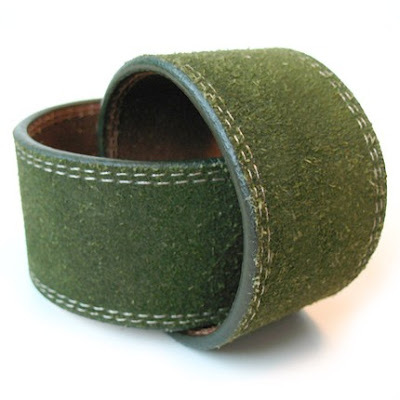 This week's eco-find is Greenbelts - funky one-of-a-kind accessories made from post-consumer recycled belts, by Shannon Ritscher. I had the pleasure of interviewing Shannon about her label and recycling ethic. For dog owners, there's also the stylish Eco leash and cuff set. Anyway, to the interview. Tell us a bit about yourself and what you make. My name is Shannon Ritscher. I made a living as a corporate graphic designer for many years before having a child and becoming a stay-at-home mom. I am now a full time mom, part-time freelance graphic designer and creator of Greenbelts. I create my Greenbelts out of recycled materials (mainly belts). They are dog collars, leashes and human accessories such as cuffs (both wrist and ankle), collar/cuff sets, belts, boot chains and rings. How did you start making accessories? I always enjoyed design but yearned for something a bit more "creative". I decided that it might be fun to spin my passion for recycling into something that could help our household make ends meet. I found a leather collar one day that I thought was beautiful and I knew I could make it's equal (or better) out of recycled materials. I try my best to make most of my Christmas presents by hand each year so, the year after my son was born, I decided that I would make dog collars and cuffs for my friends and family. I bought a leather-workers starter kit from my local Tandy leather store and some recycled belts from several second hand stores. My house is teeny-tiny so I asked my neighbors if I could borrow their workbench in their basement for a while so I could make my gifts. The cuffs and collars were a hit! One of my other neighbors saw some of the collars that I was making and told me about Etsy. I fell in love with the site, opened a shop right away, and continued to borrow the workbench to create my Greenbelts for a year after that. My husband, Chris, finally built me a little shed/studio on our back porch so I could give the neighbors a break. What kind of person shops at Greenbelts? Eco-friendly, unique, funky, practical types. Tell us about your materials. What new supplies do you use? What recycled? All of my belts are 100% post consumer materials. I hand cut thousands of flowers out of recycled scrap leather, reuse chain from old necklaces, cut the pin backs off of vintage brooches, reuse vintage buttons and anything else that looks like it can be attached to a cuff or collar. 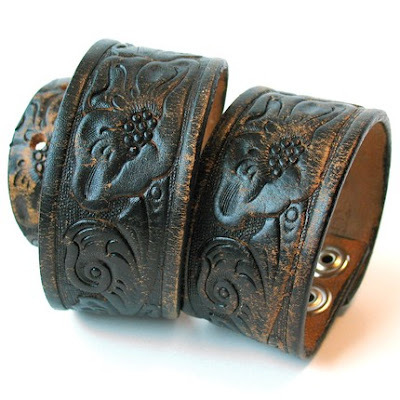 I also recycle buckles, rings, and any embellishments when I can. 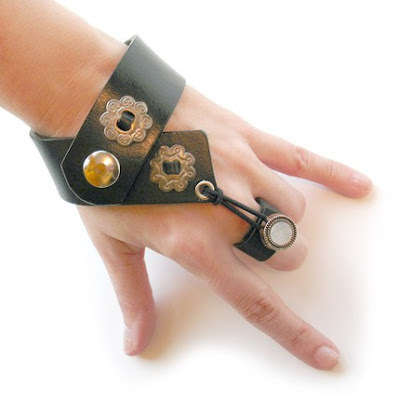 I add new items like rhinestones, rivets, metal spots, snaps, buckles and D-rings when needed. Why do you use recycled materials? Because that's what makes each item unique. 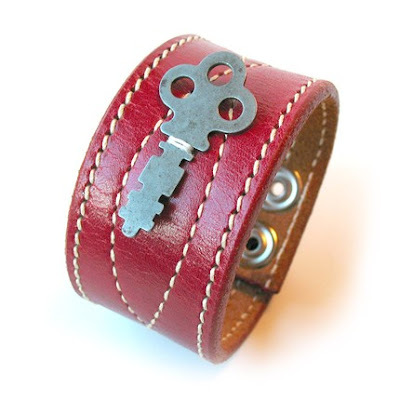 There are tons of people out there who make cuffs and collars but when you recycle materials, you know that it's going to be one-of-a-kind. And I love that whole idea. Which item of yours is your favourite? Thanks so much for the great feature Hayley. I REALLY appreciate your support! I've been eyeing this shop for a while now, I LOVE those corset anklets! Thanks for the add! Your comment went to my spam folder and I just found it! I would be happy to exchange links! The Made It relaunch is here! Why care about the envrionment? Australian fashion ethics to improve?